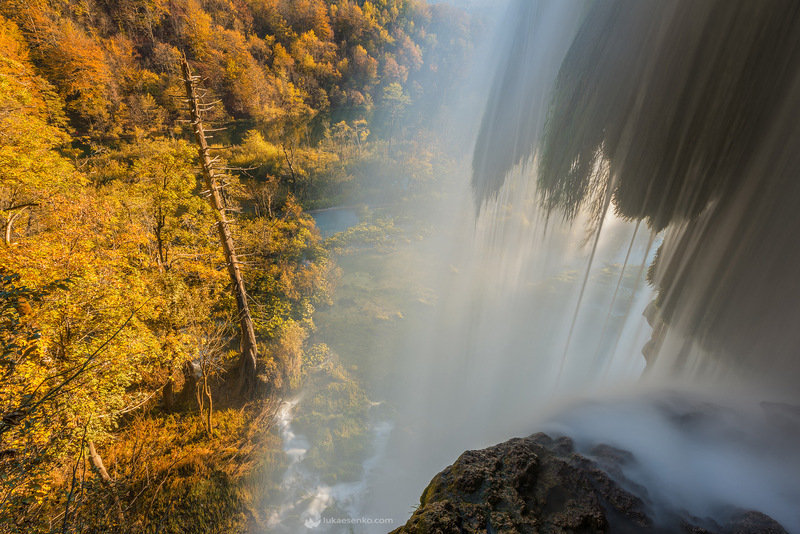 Plitvice Lakes national park in Croatia is one of the most beautiful places in the region. I always look forward to come back to the park, especially when the park is at its best for photography. This is usually early Summer, Autumn when the colours kick in and in Winter when there is snow and ice. Last week I was co-leading a photography tour with Strabo Photo TC and with Tom Bol. We spent two nights there and had four photography sessions there. Two afternoons and two mornings. The most productive was the last morning when we headed out before sunrise to be at the waterfalls when the sun comes in. What a stark contrast to the day before, when there was a record high number of visitors per day – 13.000! This morning we had the park for ourselves – for about an hour and half we were the only visitors there. What a bliss, especially because we were able to use our tripods on board walks. Autumn colours have started to appear and I bet now must be even better. If you plan to visit the park – do it in the next 10 days – the colours should be fantastic! Here are some images that I like for this last visit. if you like them, share the post, I will appreciate it! Thank you! Ok, to start a conversation – which image is your favourite?